In a more figurative sense, the term may be used for music composed in memory of the deceased. Igor Stravinsky composed in 1958 Epitaphium for flute, clarinet and harp. In 1967 Krzysztof Meyer called his Symphony No. 2 for choir and orchestra Epitaphium Stanisław Wiechowicz in memoriam. Jeffrey Lewis composed Epitaphium – Children of the Sun for narrator, chamber choir, piano, flute, clarinet and percussion. Bronius Kutavičius composed in 1998 Epitaphium temporum pereunti. Valentin Silvestrov composed in 1999 Epitaph L.B. (Епітафія Л.Б.) for viola (or cello) and piano. In 2007 Graham Waterhouse composed Epitaphium for string trio as a tribute to the memory of his father William Waterhouse. The South African poet Gert Vlok Nel wrote an (originally) untitled song, which appeared on his first music album 'Beaufort-Wes se Beautiful Woorde' as 'Epitaph', because his producer Eckard Potgieter told him that the song sounded like an epitaph. David Bowie's final album, Blackstar, released in 2016, is generally seen as his musical epitaph, with singles 'Blackstar' and 'Lazarus' often singled out. 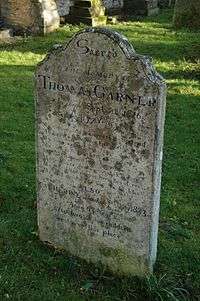 ↑ "Online Etymology Dictionary: Epitaph". Etymonline.com. Retrieved 2012-03-18. ↑ Charles Dickens (1893). Dickens' Dictionary Of The Thames. p. 269. ↑ "Milligan gets last laugh on grave". BBC News Online. 2004-05-24. Retrieved 2015-06-08. 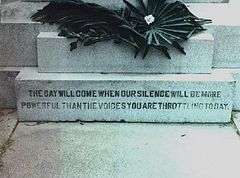 ↑ "Famous Epitaph on Unknown Soldier tomb stone". Famousquotes.me.uk. Retrieved 2012-03-18. ↑ Thucydides (1843). "History of the Peloponnesian War 2.34.3". In Molesworth, William. The English works of Thomas Hobbes of Malmesbury. VIII. Thomas Hobbes (translator). London: John Bohn. p. 188. Available online at the Perseus Project. ↑ Thucydides (1910). "2.43.3". The Peloponnesian War. Translated by Richard Crawley. London, New York: J. M. Dent; E. P. Dutton. Available online at the Perseus Project. 1 2 Porco, Carolyn. "The Eugene M. Shoemaker Tribute". Diamond Sky Productions. Retrieved 8 June 2013.